At GeoSupply, we are proud to be the Southwest's largest stocking distributor of premier geotextile, geogrid, geomembrane, erosion control, and stormwater management products. Whatever your needs, our team of soil solutions professionals will consult with you to determine the best product for your particular application, and can advise you of the most cost effective solution for your project. Quality products. Service Expertise. Competitive pricing. 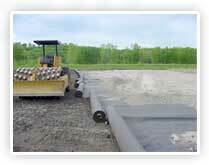 We are GeoSupply...your soil solutions partner.